What an incredible collaboration ~ Levi’s x Opening Ceremony and design collective, CITIZEN:Citizen. There’s an unmistakable signature to all things CITIZEN:Citizen touches ~ and this is certainly the work of Philip Wood! Playful, with a high art flair, bringing a smile to your face before you even understand what is going on fully… and as you delve deeper into it, his concepts reach further than you expect! I can’t wait to see what the transformed basement of the Levi’s flagship store will be like tomorrow night, unfortunately i’ll be on a red-eye to NY, but hopefully some of you can go experience it for me! For now… take a peek at the scene around san francisco, and the beautifully designed invitations and posters! p.s. don’t forget! Chance at VIP tickets… ENTER TO WIN, HERE! “I’m on a horse.” Hahaha. Ok, i’m sorry, i’ve been watching this one over and over for days and sharing it with people and it just cracks me up every time. So just in case you haven’t already seen the Old Spice “The Man Your Man Could Smell Like” ad… watch it above. If you have? Watch it again! p.s. you can even find the actor, Isaiah Mustafa, on twitter and imdb. Oh, Incase, you’ve done it again. Your surprise packages always blow me away… and now i’m terribly jealous of your amazing TAPE!!! 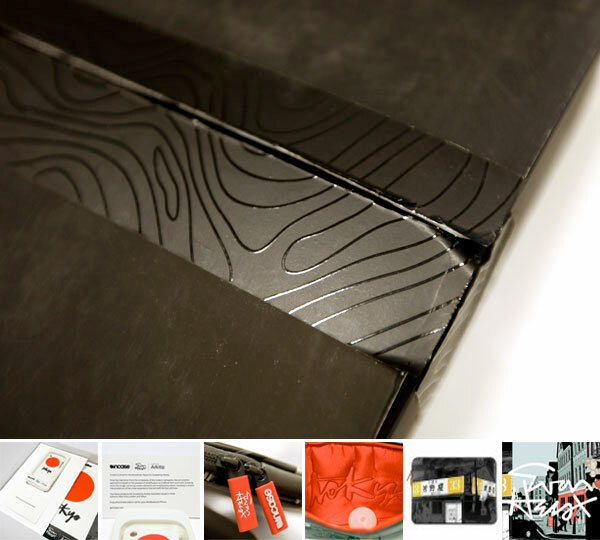 Matte black with the Incase signature topographic pattern in gloss… you’ve taken packing tape lust to a new level! AND its on a soft touch rubberized feeling matte black BOX. Yes, i couldn’t help rubbing the box before i even got to opening it. It was one of those nights. Just needed something amusing and random to do ~ so a late night adventure with Linhchi meant scheming over the fire pit at Johnnies, then suddenly going to Home Depot to buy spray paint, popping by the other house to grab some penguins… then to the garage! To lay on lounge chairs, take silly pictures (testing out my new purse cam the d-lux 4 ~ it makes some impressively pretty colors, esp in low light), and spray paint tester pieces of a sad broken puma penguin… we learned things like, penguin looks awesome just about anywhere… lacquer and gloss weren’t working so well… light coats of matte seem ok, but needs a few coats and then some clear gloss… perhaps tomorrow in the hot sun we’ll try spraying down a whole penguin… but as for tonight, the pictures looked adorably eerie as the purple penguin cast poignant shadows and sprayed down pieces of his orange friend. or enemy. you can make up your own backstory. See the pics on the next page! On cell phone obsessions ~ i love a great button. I used to love my old Sony Ericsson joystick. There’s something about my blackberry’s trackball thats just so fun to spin. That indentation of the iPhone button just feels good to click! Latest button lust? 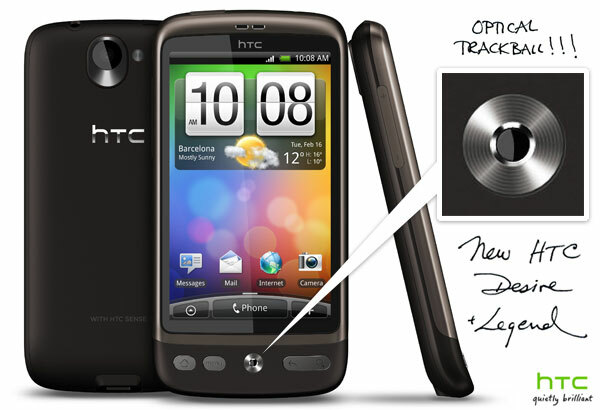 On the new HTC Desire and HTC Legend phones launching today… they feature a brand new OPTICAL TRACKBALL! In the conference call announcing them they said trackball, in the press release it says joystick… really you can call it what you want, basically they’ve described it as a little optical sensor ever so slightly depressed in the center of a single solid ring of a button. I can’t wait to try this physical interface in person! Perhaps one of the most enticing aspects of HTC, beyond their hardware that feels SO good in your hand… is their dedication to great UX ~ above and beyond what is provided through Android and Win Mobile! At the Mobile World Congress today, they are not only announcing new phones, but also the latest iteration of HTC Sense - “HTC Sense is a user experience focused on putting people at the centre by making phones work in a more simple and natural way. This experience revolves around three fundamental principles that were developed by observing and listening to how people live and communicate. These core tenets of Make It Mine, Stay Close and Discover the Unexpected continue to be the key to the new HTC Sense experience.” The new version adds more features that are focused around your most important people with the HTC Friend Stream (pulling in from facebook, twitter, flickr, and more). See more details on the next page! HAPPY Valentine’s Day, Chinese New Year, and President’s Day! (Did i miss any? What a long weekend this is!) And i’m back! After quite a bit of travel/meetup madness, drove back to LA, then hid out last night, only to wake up to the crashing of socal waves outside the window.. and i’m feeling more excited and rejuvenated than ever for what 2010 has in store for NOTCOT. 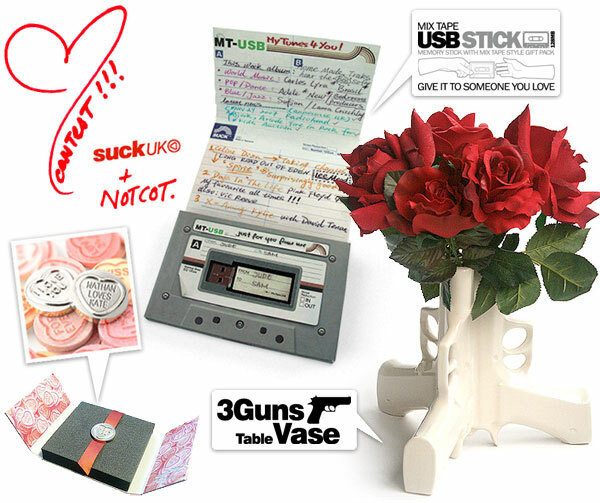 3 Guns Table Vase, Mixtape USB Stick, and Silver Plated Love Hearts Sweet (A perfect replica of the classic sweet. Says “I Love You”) ~ FOR A CHANCE TO WIN: Leave a note with what you have planned for this weekend! I’ll email the winner on Tuesday the 16th of Feb.
Mixtape USB Stick ~ the TWITTER giveaway ~ follow me, @NOTCOT, and tweet @NOTCOT with your pick for the ultimate mixtape song and use #notsuck so i can find it. I’ll D the winner on Tuesday the 16th of Feb, so make sure you’re following @NOTCOT! So after a bit of hotel horrors ~ and bouncing in and out of the vitale over the last week ~ with sf gift fair and macworld happening, SF hotels seem a bit packed… just decided to check out the Clift Hotel in San Francisco which is part of the Morgans Hotel Group (with those awesome “The world needs to discuss it over drinks. 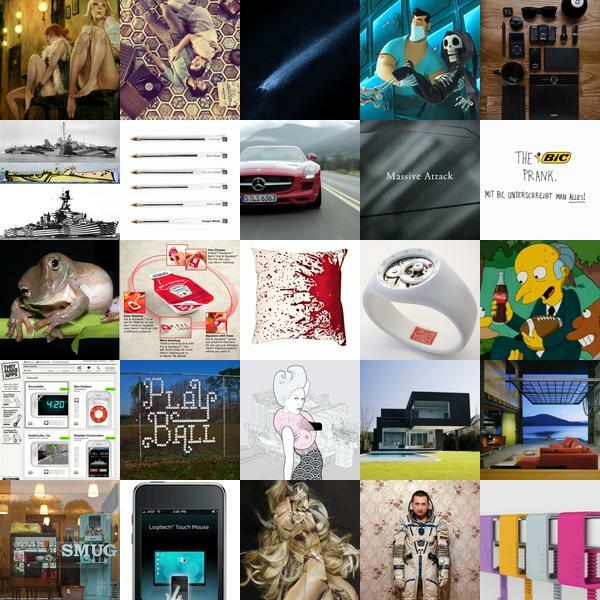 The world needs more interesting.” ads i adore. 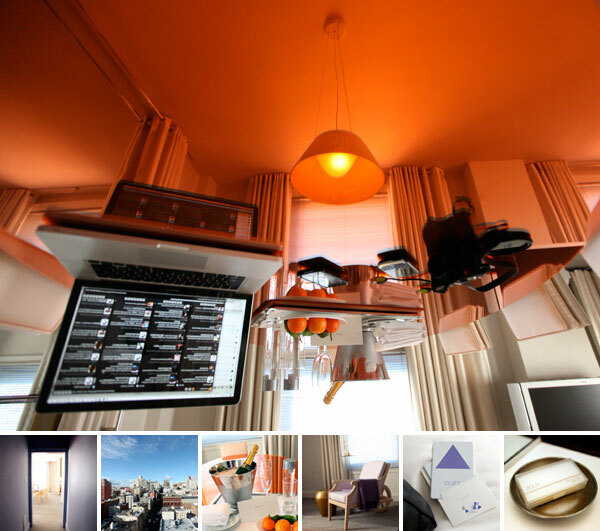 )… they were nice enough to upgrade me to experience one of their suites, and i’m currently working at that “through the… orange… looking glass” feeling table above… and really, between the bizarre world within it and the stunning city views here, it’s hard to focus! It’s also incredibly calming and relaxing with it’s lavender entry way, light grey carpeting, and light wood furnishings… exactly what i needed after quite the crazy last few days! 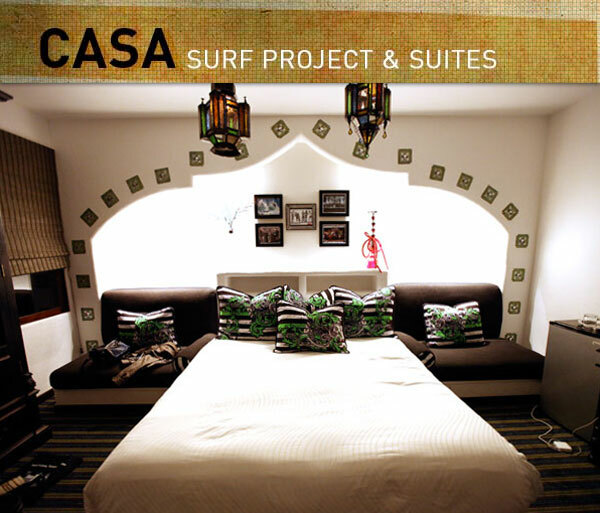 Go take a peek into their fun, spacious, suite i’m living in for the next few days on the next page! Apologies for going a little quiet the last few days ~ gave up internet for wine this weekend for the second annual #Time4Wine event in Napa, where a bunch of social media folks came together for good times and wine tasting at wineries with twitter presences… SO fun, so delicious, and yes, there may be a case in my car… and many silly pics went up at Life.NOTCOT.com where random cell phone pics and daily randomness with no home go. There was even a Salamanzar of Rose… yes 12 bottles worth! 9L! It’s HUGE! It also disappeared in no time. 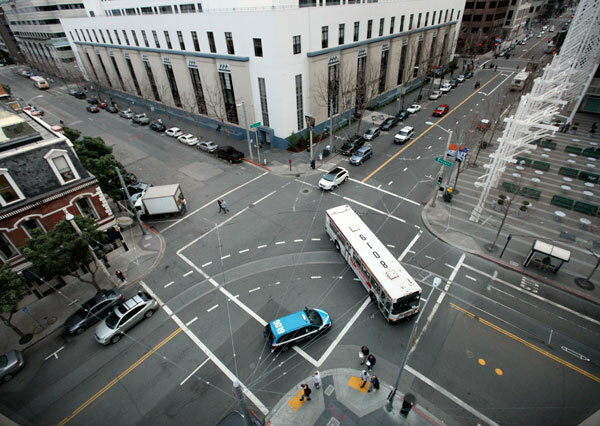 Additionally, got back into SF city, had a bit of a hotel disaster that i thought would explode my brain, and that lead in to a rather thrown off Monday… and now it’s Tuesday! Already! So here’s a roundup of some of the awesomeness that has been flowing through NOTCOT.org the last week. As usual (or not so usual, seeing as roundups haven’t been as frequent as i intend to make them) ~ click any of the squares to find out more! They are finally nearly here! Andrew Bell teased me with sneak peeks of toys in the making on his phone over lunch a few months back ~ so long as i promised to stay quiet. Well, it’s been hard! Because, we all know as fun as the Google Android phones and UI are… i’m pretty smitten with the adorable mascot. And here they finally are! A series of blind box toys bringing that adorable little Android to life! The details? Illustrator and toy designer Andrew Bell has teamed up with a few friends at Google’s Android project to bring their green mascot to life. 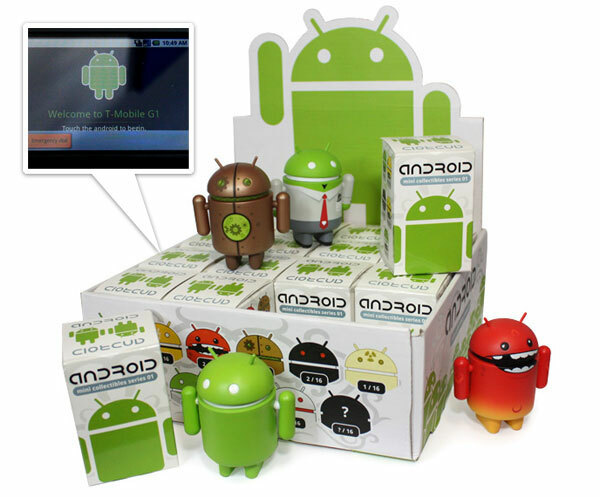 Presenting Android mini collectibles series 01! Each 3” vinyl figure sports one of 12 different possible designs and features a rotating head and arms. Packed in “blind boxes” so you don’t know which design you get until you open it up. 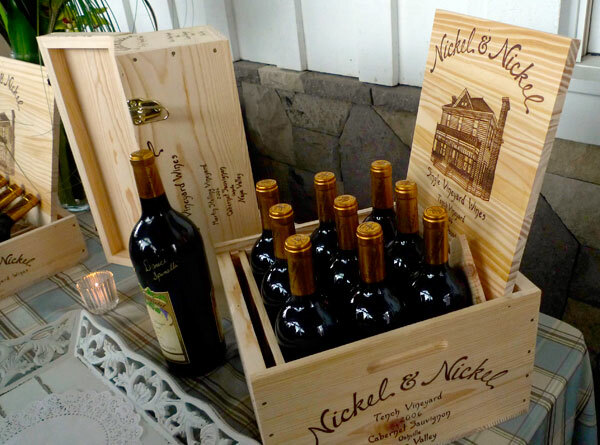 Pick one up and take a chance or grab a case for a near-complete set. 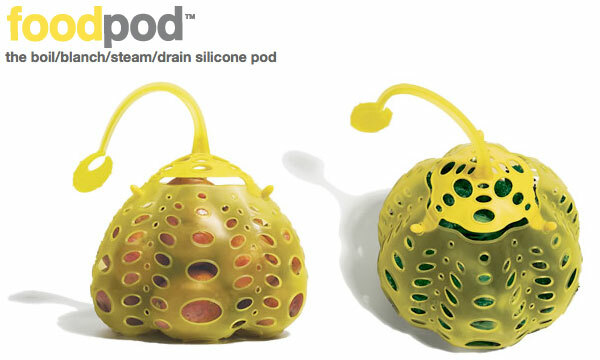 Available in an initial limited release later this month from dyzplastic and specialty retailers. I think i fell in love with the video installations of Jennifer West at the Calvin Klein Collection + LAND art event tonight… or perhaps, it’s the way people interacted with it. 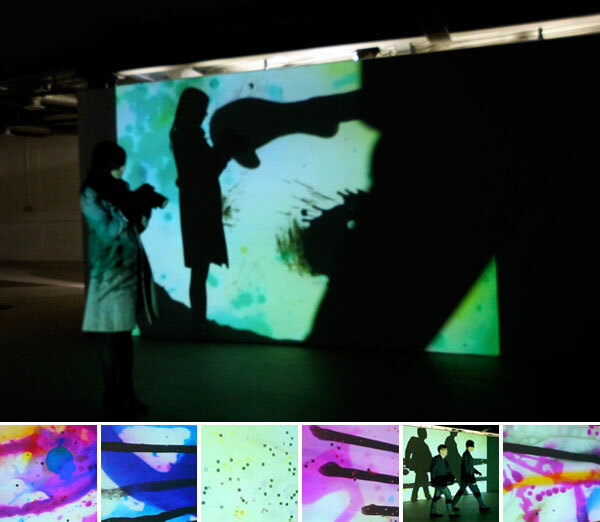 a large open space, multiple spastic video projections pulling you in ~ colorful, intriguing, and apparently the perfect thing to make stunning shadows as people passed in front of them. While i can’t seem to find a website for her, i did find this fun interview on Flash Art Online about these pieces! Turns out she’s a topangan! And the way she works with and physically manipulates real film fascinates me in this digital age… her love of and experimentation with abstraction and representation is beautiful! Beautiful and fun enough it certainly needed a post of its own! So take a peek at some of my favorite pics involving her projections from the night ~ as well as a video! That really gives you a good feel for the experience… i suggest playing it full screen in HD mode!